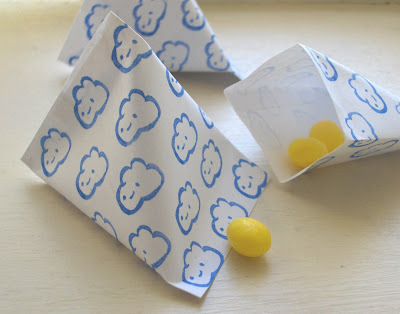 Here's an easy favor to make to fill with candy or other small items. This idea came from a friend and I thought I would share it with all of you. The paper used for the favors was made with a stamp from mushroommeaddows. 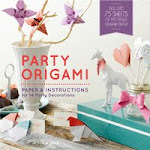 Wrapping paper also works well for this project. Flip paper upside down. 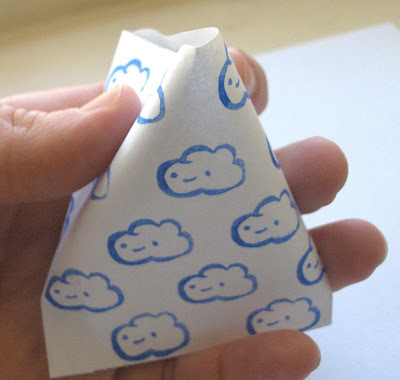 Fold paper to make a small tab (refer to picture). Where yellow lines are, place double sided tape. 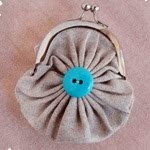 Fold in half to make a little pouch like the picture above. Seal the bottom. Fill with candy. Squeeze sides togeather to seal. The favor should resemble a triangle. Haha... 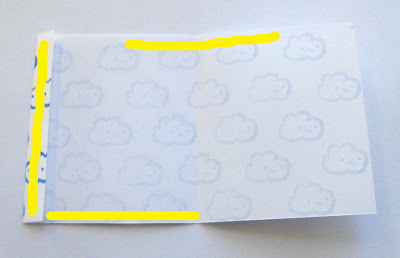 I like the cloud printed on the paper. It is really cute. I'm glad you could use the stamp! This project looks awesome! It seems much easier than using a box template, which can be totally frustrating. :) Thanks for sharing!!! I really like the triangle shape. 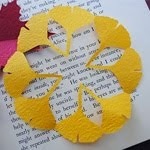 I can't wait to make these for party favors for Melody's first birthday party next year. That's really darling. Thank you for sharing it and for your beautiful blog. Love your blog! 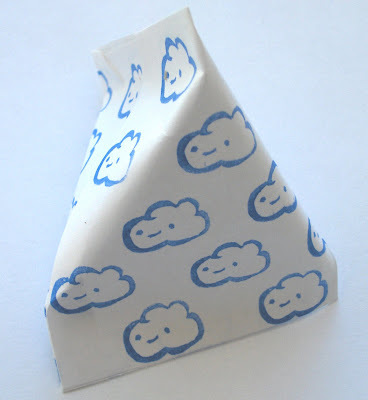 what sweet little treat bags - and the clouds are precious! Those are SO cute! What a great idea. I need to find some cute stamps! You are such a sweet woman, this is a really sweet blog. Greetings from miles away, Istanbul, Turkey! These are great! 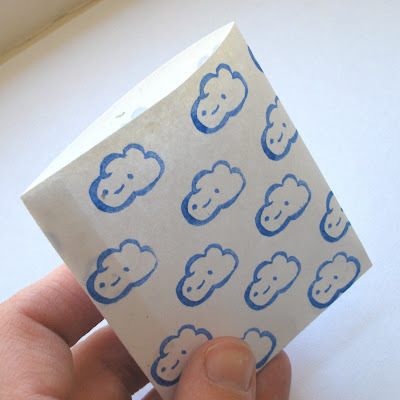 I just used this idea to package some felt fortune cookie greeting cards. Your ideas are great inspiration and your tutorials are fantastic. Thanks so much! I love the little clouds. 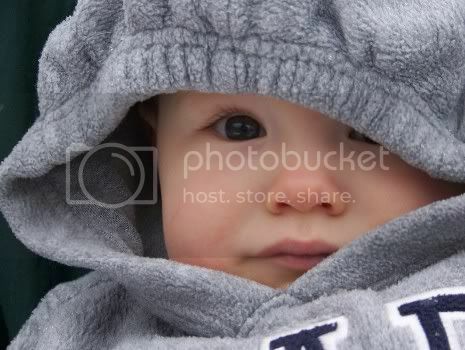 Simple, sweet, and so adorable. You're wonderful! Just added you to my google home page! So clever! Thanks for the tutorial.